All employees and companies conducting business at Jacksonville International Airport (JAX) must be screened before they are authorized to work on airport property. Authorization consists of but is not limited to completing the JAA badge application, completion of a fingerprint-based FBI background check and TSA Threat Assessment. Once these requirements are met, the Certifying Official can schedule an appointment for their employee to attend Security Identification Display Area (SIDA) training if applicable. The employee will receive their badge upon successful completion of SIDA training. Once issued, badges must be renewed annually. Badge holders can renew their badge 30 days prior to the badge expiration date. To obtain a Security Identification Display Area (SIDA) badge, the Certifying Official must schedule appointments for security training. Computer-based training is available Monday through Thursday from 7:00 a.m. to 3:30 p.m (excluding holidays). Training courses are approximately one hour per course. 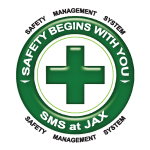 Certifying Officials must contact the badging office at badgingoffice@flyjacksonville.com to schedule training appointments. The badging office and training room are located on the lower level of the airport. To get to the lower level, take the Elevator or stairs located behind Insight in the central courtyard. Once on the lower level, follow the appropriate signage to the Access Control Office. Access Control office hours are Monday through Thursday from 7:00 am to 5 pm and closed on Fridays. Directions to the badging office can be found here. Certifying Officials are designated representatives authorized to sponsor and request airport ID badges. All companies conducting business at the airport are required to designate Certifying Officials per TSA Directive SD1542-04-08N. Becoming a Certifying Official consists of but is not limited to successfully completing a FBI background check and TSA Threat Assessment. Each company must have a minimum of 2 Certifying Officials. More information for Certifying Officials can be found here. Certifying Official Training is held Fridays at 10:00 a.m. and must be scheduled in advance with the Access Control Manager. Contact the badging office at badgingoffice@flyjacksonville.com, to schedule an appointment. All JAX photo ID badge holders and Certifying Officials must remain compliant with all Transportation Security Regulations and CFRs 49 Part 1542 and Part 1544. Regulatory procedures and requirements are governed and monitored by the Transportation Security Administration (TSA). Failure to meet these requirements can result in citations and fines to the company/agency and Jacksonville International Airport.